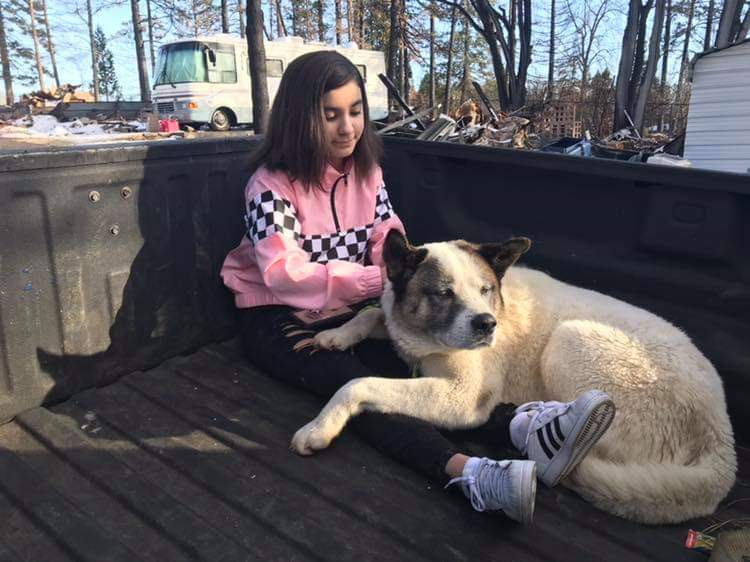 Kingston the dog jumped out of his family’s pickup truck 101 days ago. They were driving away from a terrible wildfire in Northern California. Flames engulfed their hometown of Paradise. Did the crackling and popping sounds of the fire scare him? Or did he panic when thick smoke made it hard for him to breathe? Did the flashing flames make him fidgety? Whatever the reason, Kingston ran away. His family waited for him for the next 101 days. They never lost hope. They posted flyers and checked in with animal shelters. Week after week, they searched for Kingston. Every night, Maleah Ballejos asked her dad to look for their family dog. She knew he was a survivor. Months after the fire, animal rescue volunteer Ben Lepe spotted Kingston on surveillance cameras. Mr. Lepe wanted to help the big dog. He set up a trap and caught Kingston the very next day. He says, “It was awesome to see him and know he would be fed and warm.” Mr. Lepe took the dog to Friends of Camp Fire Cats, a local rescue group. A “Missing Dog” message was posted on social media. Volunteers saw the message and contacted Kingston’s family. So how exactly did Kingston survive? No one knows for sure. But the big Akita breed dog did give them one big clue. Family members think he survived by eating skunks. When they picked him up, he smelled like a skunk. Apparently, the stinky dog used to enjoy hunting skunks. Pee-Eww! Kingston’s family couldn’t stand being separated from him. The Bible tells us that there is absolutely nothing that can separate us from God’s love.